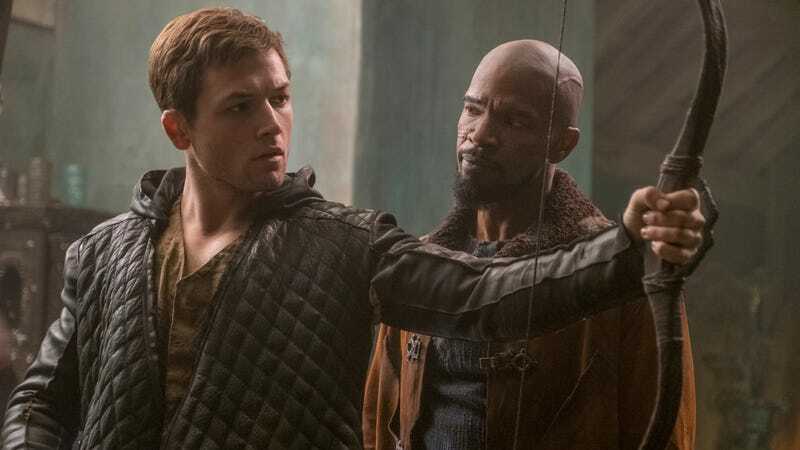 Robbing from its rich investors and giving to no one in particular—save for maybe fans of tedious voice-overs and speed-ramped hogwash—the newest iteration of Robin Hood failed to hit the bullseye over the Thanksgiving weekend. In fact, the lunkheaded action spectacle looks to be taking home a far different award: biggest bomb of the year. That’s the takeaway from the opening weekend haul of the legendary outlaw’s tale, which crapped the medieval bed with the worst start for any blockbuster-sized movie (read: a budget of $90 million or more) of 2018. It’s certainly the worst performer of any of the year’s studio-tentpole releases, far outpacing the more modest financial failures (like The Predator, which at least managed to recoup its money internationally) by delivering a total of $9.1 million (only going above $10 mil if you take into account the five-day holiday, bringing it up to $14.2 million), landing it in seventh place on the charts, right in between Instant Family and Widows. At least The Nutcracker And The Four Realms (in 11th place with a $2.7 million weekend) can feel better about no longer being the biggest dud of the season. The news was much brighter for the other major releases, starting with Ralph Breaks The Internet, which unsurprisingly took the top spot with a cartoonishly big $55.7 million, which jumps to a whopping $84.4 over the entire extended holiday weekend. True, it sacrificed its title character’s main activity in favor of current slang (for god’s sake, it’s right in his name, Wreck-It Ralph! He wrecks the internet! Who thought “breaks” was a better title? ), but the family-friendly behemoth dominated the box-office landscape like an animated colossus. In second place was Creed II, well-received both critically and commercially with a $35.2 million bow ($55.8m over the five-day holiday) that easily knocked out any challengers for its belt. That left a grinch, a Grindelwald, and a great Live Aid performance to round out the top five. Dr. Suess’ The Grinch dropped one spot to third place, crossing the loudest snow ever to make $30.2 million and thereby cast a spell of staying power that allowed it to triumph over Fantastic Beasts: The Crimes Of Grindelwald ($29.6 million), only in its second week but dropping by more than 50 percent, which doesn’t bode well for the Potter-poaching film’s longevity. The big surprise continues to be Bohemian Rhapsody, the Queen biopic that hangs on to the number five spot in its fourth week in theaters, adding $13.8 million to its total while another Hood bites the dust. Further down the list is the other noteworthy new release The Favourite, which you should definitely go see once it expands beyond the four theaters it’s currently holding down, where it took in $420,000 for the 19th spot and a massive per-theater average of $105,000, a number worthy of a queen. (Just not, you know, Queen.) The quite good Shoplifters enters the charts at 31 with $88,000 from five theaters, a respectable bow. And A Star Is Born added $3 million over the weekend, bringing its total to $191 million and threatening to grab the mic and earn more than $200 million domestically, a number worth singing about.